Trista is the maker and designer behind While They Dream. She lives in Minnesota with her husband, three children, house full of fur friends. When she isn’t playing with yarn she is out grabbing a cup of coffee and spending time with her family. Hey everyone! I’m Trista, the designer behind While They Dream. I have always had a love for creating things with my hands; especially fibers. My high school offered many different art classes and I took any that I could. When I graduated I didn’t have the same outlets for my creativity as I did when I was in High School. It wasn’t until 2011 (around 7 years later) that I began crocheting. 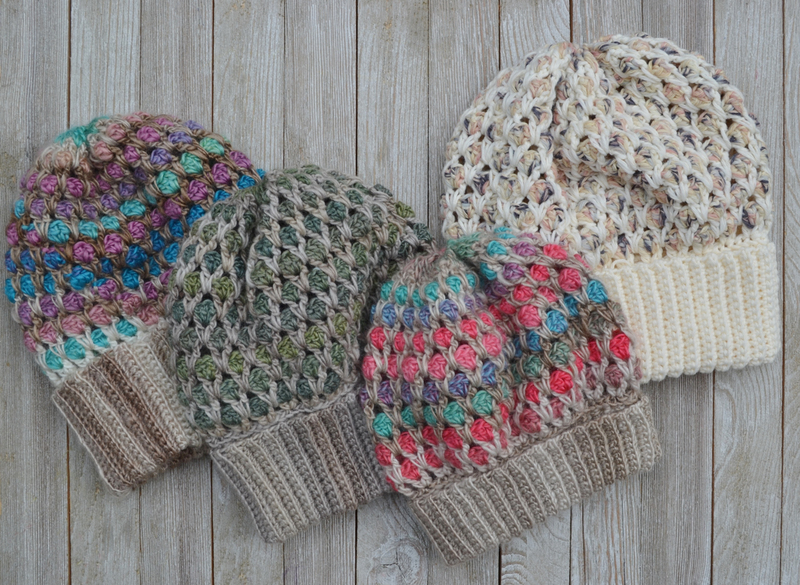 I had no prior experience with crocheting or knitting, so I was completely self-taught. I wanted to be able to create memorable items for my son, who was a year old at the time. I began with a hat and then decided to get crazy and make a Lalylala doll (Dirk, to be exact…I guess I like a challenge). I was completely hooked (no pun intended). From there I took off. I’ve been so happy to have a creative outlet in my life again. What started as a hobby, became much more than that. Throughout the years it has become my meditation, my calm, and my cheap therapy. It’s part of my daily life. It is what I have turned to in happiness and in my most sad moments. I started designing my own crochet and knit items in November 2017 and it’s taken my love for this craft in a whole new direction. The Zwina Slouch is one of my more intricate designs. I think you’ll find that it’s easier than it looks. - 4.25mm/G hook (note on this size: I have found that the G hook is an odd hook and that each company chooses how they would like to label the G hook…yours may be a 4mm). 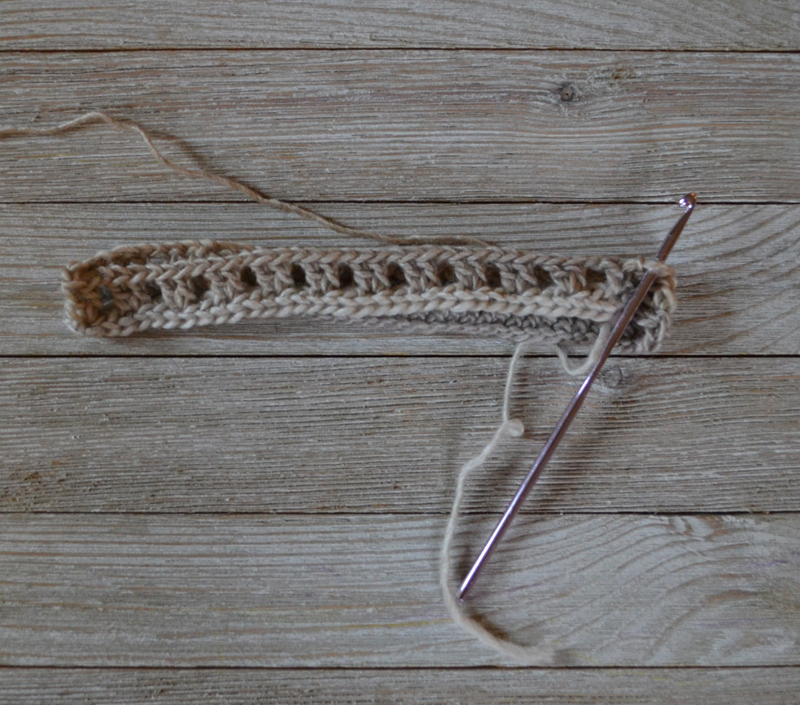 - 5mm/H hook will need to be used on the brim only if you choose to use a cotton yarn. - Light worsted weight (4) yarn OR DK weight (3) yarn. You will need a main color and a contrasting color. The contrasting color is the most fun if the shades/colors change quickly. Lion Brand Comfy Cotton (This is a more structured yarn than the other two yarn suggestions and is a DK weight (3). If you choose to use this, use the suggested 4.25mm/G hook for the body, but use a 5mm/H for the brim). color row and one contrasting row) should stand 1” in height. These are suggestions. You may find that you need a longer chain to achieve the proper fit. Use this as a guide. 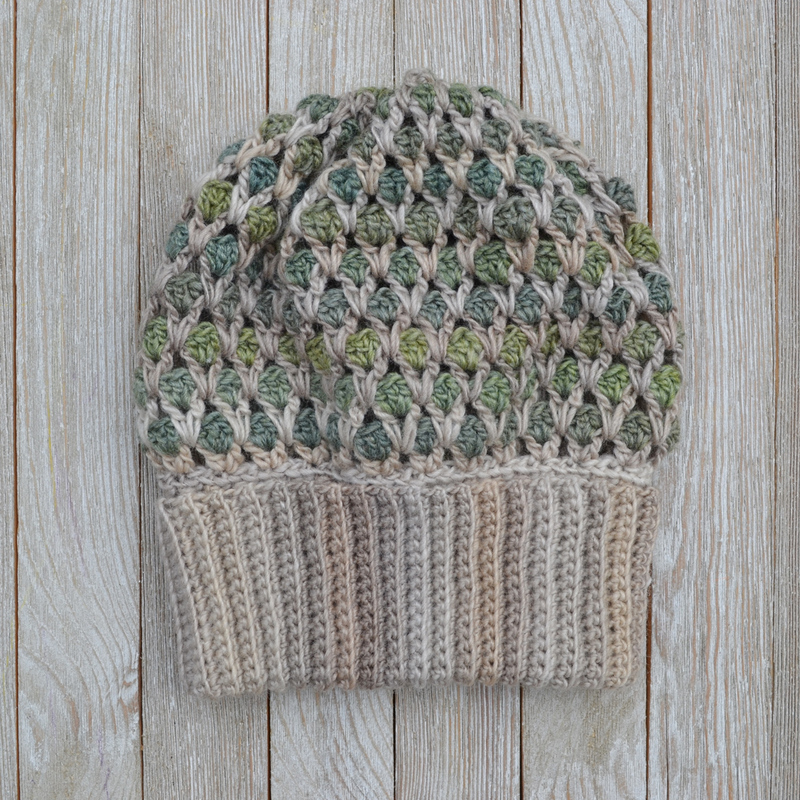 This hat is intended to fit relaxed and slightly slouchy in the body and snug/fitted in the brim (I want it to be initially snug in the brim due to the fact that crochet has a tendency to relax with wear; this will ensure that the brim will keep fitting nicely in the future). Your brim will be made extra-long so that you can fold it over in the end. When you make the body of the hat it will sit above your ears and be relaxed. It is when you add the brim that you are going to gain the perfect fit and the final height of the hat. I give a beginning stitch count for this hat. The foundation chain should be held snugly around the head for sizing when starting this hat. If you find that you need to adjust for size you will need to increase or decrease by 3 stitches (beginning stitch count should always be in multiples of 3). In addition, please note that when you make your slip stitches to join your rows and pick up your next color you will find that you are moving your beginning stitch placement over. This is normal. 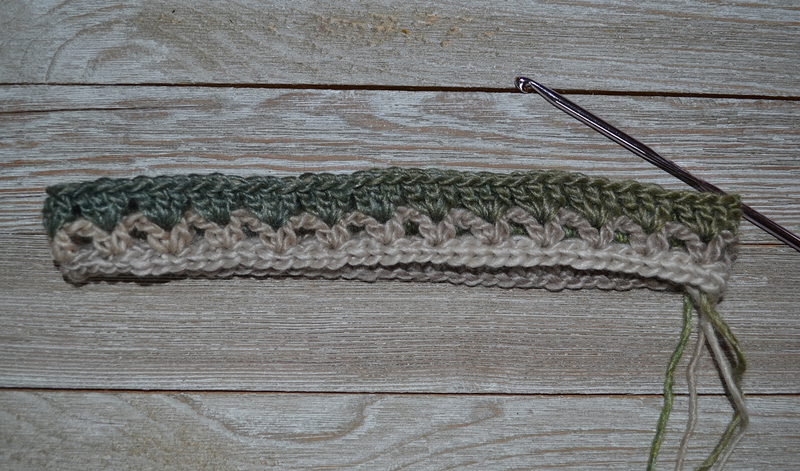 With Main Color (MC) , begin with a chainless foundation single crochet of 74 sts. Join in the round to create 75 sts. (My 2 year old, 19” boy fits really nicely in this size, as does my 5 year old, 20” girl. If you find that your 1-3 year old needs a smaller chain, try a 66 or 72 stitch start). With Main Color (MC) , begin with a chainless foundation single crochet of 77 sts. Join in the round to create 78 sts. (My 8 year old, 21” boy found that he really prefers the 78 stitch start, if you find that the 21” head needs a smaller start, I would size down to 75 stitches). Row 1: Continue using MC. Ch 2 (counts as your first DC stitch). DC in the same space. Ch 1, Skip 2. *2 DC in the next st, ch 1, skip 2* repeat around. Join with slst to the ch 2. Drop your MC (do not cut yarn). Sl st again into the same space to join in your Contrasting Color (CC). See photo “b” for reference. Row 2: With CC, ch 3 (counts as first DC). Work 2 more DC into that same space. *Work 3 DC between your next 2 DC* repeat around. Join with slst to the top of the first st. Slst into the next st. Drop CC and slst into the ch 1 space between your clusters with your MC yarn. From this point forward, for every row, you need to be careful not to pull the yarn too tight here. Leave some slack so that you do not create any puckering to your rows. Row 3: With MC, ch 2 (this does not count as a DC). *Make 2 DC into the ch 1 space from your previous Main Color row (two rows down). Ch 1* repeat around. Join with slst to the top of the first st. Drop MC and slst between your two DC sts with your CC yarn. Rows 4 – 11: Repeat rows 2 & 3 four more times. Rows 4 – 13: Repeat rows 2 & 3 five more times. Note for all sizes: Your hat will not really “fit” your head yet (in terms of length). The brim you will now work on attaching will be what adds your length. Row 12: With CC, ch 3 (counts as first DC). Work 1 more DC into that same space. *Work 2 DC between your next 2 DC* repeat around. Join with slst to the top of the first st. Slst into the next st. Drop CC and slst into the ch 1 space between your clusters with your MC yarn. Row 13: Repeat row 3. Row 14 - 15: Repeat rows 12 & 13. Row 16: With CC, ch 3 (counts as first DC). Work 1 more DC into that same space. *Work a dc2tog between your next 2 DC* repeat around. Join with slst to the top of the first st. Slst into the next st. Drop CC and slst into the space between your clusters with your MC yarn. Row 17: With MC, ch 2 (this does not count as a DC). *Make 2 DC into the ch 1 space from row previous Main Color row* repeat around (you will not be doing a chain 1 anymore). Join with slst to the top of the first st. Drop MC and slst between your two DC sts with your CC yarn. Row 18: Repeat row 16. Drop CC and fasten off, leaving a long tail. Weave your tail through every other stitch and cinch closed. If you are using a more fragile yarn, like Unforgettable, BE CAREFUL while pulling or you’re going to break your yarn! Row 14: With CC, ch 3 (counts as first DC). Work 1 more DC into that same space. *Work 2 DC between your next 2 DC* repeat around. Join with slst to the top of the first st. Slst into the next st. Drop CC and slst into the ch 1 space between your clusters with your MC yarn. Row 15: Repeat row 3. Row 16 - 17: Repeat rows 14 & 15. Row 18: With CC, ch 3 (counts as first DC). Work 1 more DC into that same space. *Work a dc2tog between your next 2 DC* repeat around. Join with slst to the top of the first st. Slst into the next st. Drop CC and slst into the space between your clusters with your MC yarn. Row 19: With MC, ch 2 (this does not count as a DC). *Make 2 DC into the ch 1 space from row previous Main Color row* repeat around (you will not be doing a chain 1 anymore). Join with slst to the top of the first st. Drop MC and slst between your two DC sts with your CC yarn. Row 20: Repeat row 16. Drop CC and fasten off, leaving a long tail. 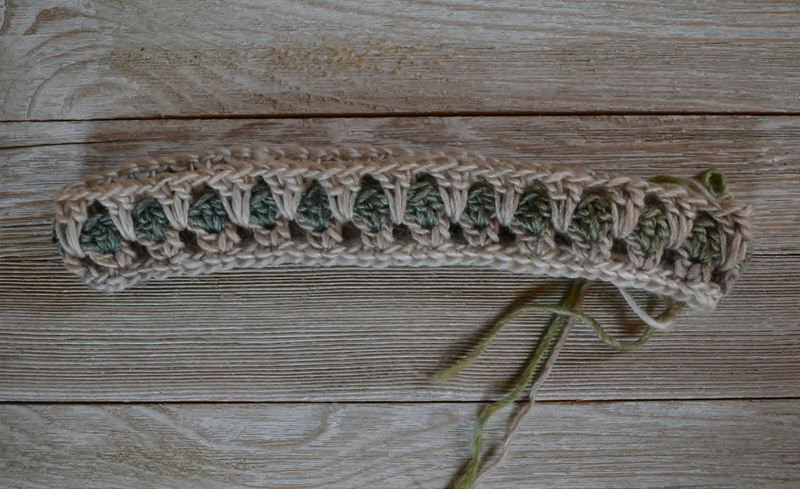 Weave your tail through every other stitch and cinch closed. Photo “e” for reference. 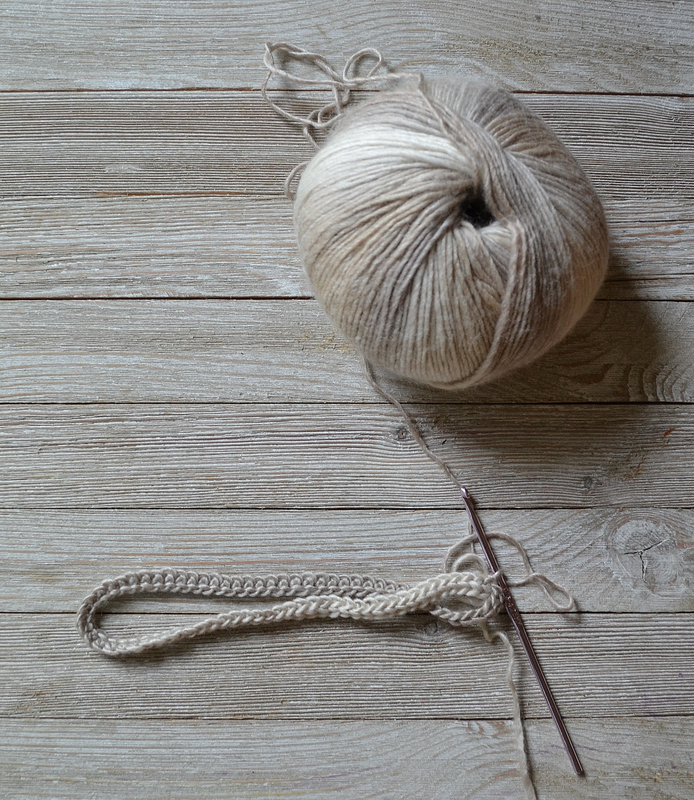 If you are using a more fragile yarn, like Unforgettable, BE CAREFUL while pulling or you’re going to break your yarn! Only switch to a 5mm hook for the brim if you are using a more structured yarn like the Lion Brand Comfy Cotton, otherwise continue with your same 4.25mm hook. 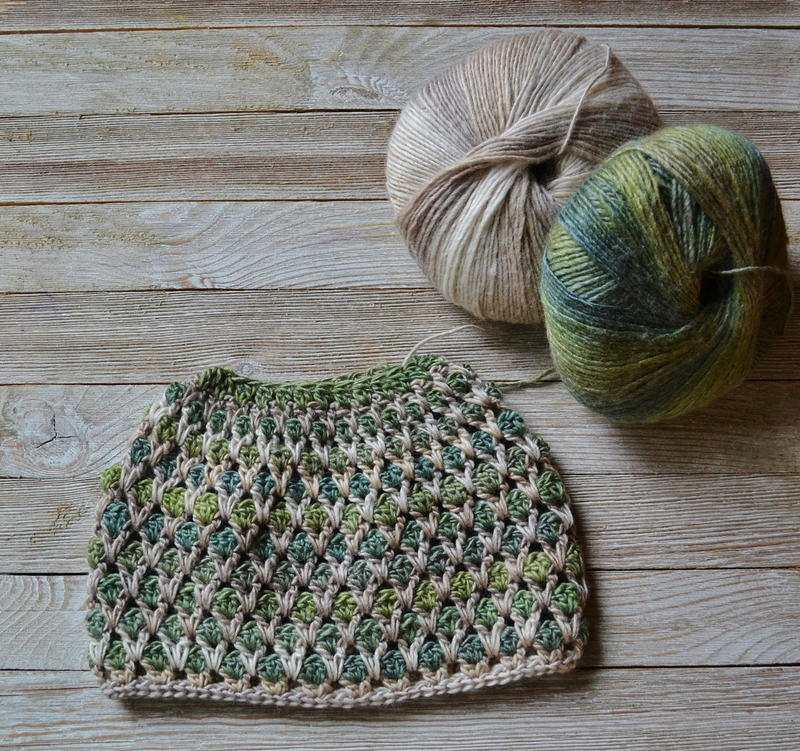 Pick any point along the bottom of your hat and attach your yarn with a slip stitch. For age 1-3 years, chain 23. Brim should be 4 ½ in long. For age 3-5 years, chain 25. Brim should be 5 in long. For age 6-small adult, chain 28. Brim should be 5 ½ in long. For age average adult, chain 33. Brim should be 6 ½ in long. In the second chain from your hook, sc. Continue to sc down your ch for a total of 22 (24, 27, 32) sc. Now you will attach this chain to your brim by making a slst in the next two stitches. Turn your work, skip those two slst and do 22 (24, 27, 32) sc in blo up the chain. Ch 1. Turn. *22 (24, 27, 32) sc in blo, slst in next 2 sts, turn your work, skip the two slst, 22 (24, 27, 32) sc in blo up the ch, ch 1, turn* repeat until your brim is finished. After your last row, slst your two ends together. Be sure to visit While They Dream for more free patterns. If you would like the PDF version of this pattern it will be available in my Ravelry and Etsy shops on December 1st, 2018.